Profile of Alec Wheeler's aquaponics system in downtown Toronto. Alec Wheeler is a sales effectiveness analyst for green energy retailer Bullfrog Power Inc. by day. 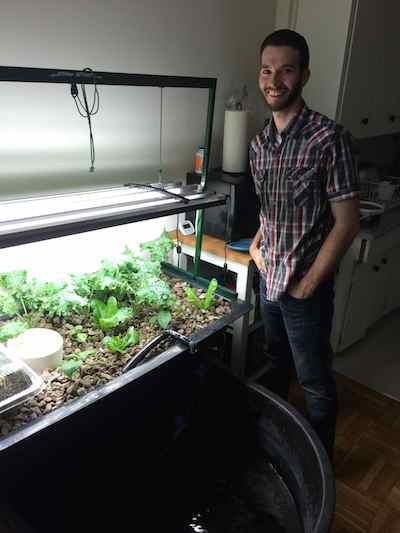 When he isn't crunching the numbers for Bullfrog Alec's other passion is aquaponics. A couple of years ago Alec started to build the aquaponics system he had been dreaming of for many years before that. The idea of providing cities healthy organic food grown sustainably right in the city itself also deals with the heavy transportation and resulting costs related to fuel and pollution inherent to our globalized food system. Ultimately Alec dreams of having vertical farms right in the city providing both vegetables and fish directly to the consumer or to local supermarkets and restaurants. The vertical farms concepts takes aquaponics and builds the systems vertically up potentially many stories high, and perhaps one day even competing with skyscrapers in the downtown core. 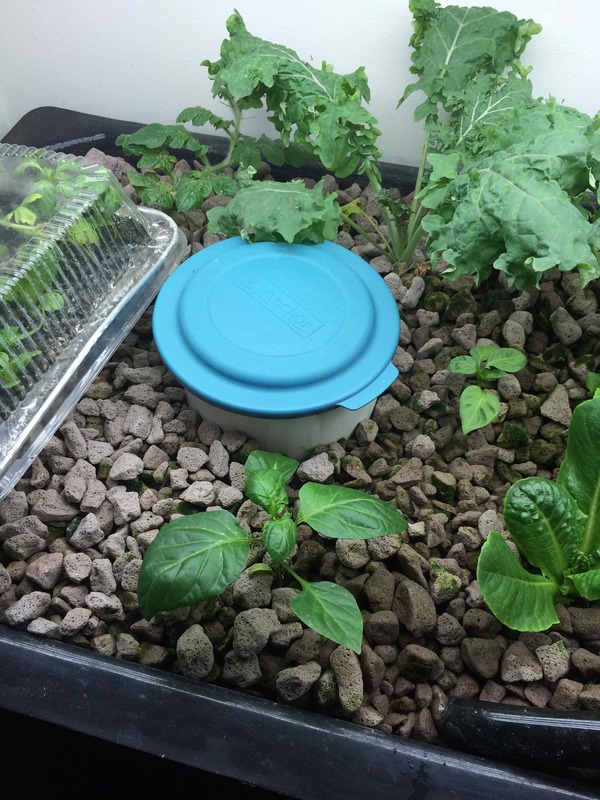 So what is an aquaponics system. At it's most basic level aquaponics tries to cycle water between plants, fish and friendly bacteria, trying to mimic one of the most basic features of the web of life in nature. Plants need water and nitrates to grow. 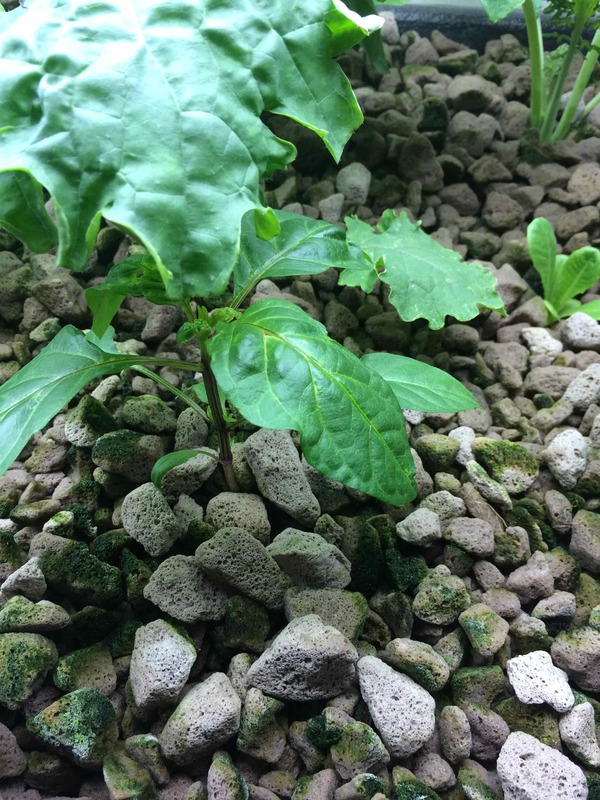 So, as the name suggests "aqua" in aquaponics reflects the use of water as the primary growing medium for both the fish and plants in the system. The fish produce ammonia in the poop they cycle through after eating fish food. Friendly bacteria that develop naturally in the system convert ammonia into nitrites. And then other friendly bacteria convert nitrite into nitrates. 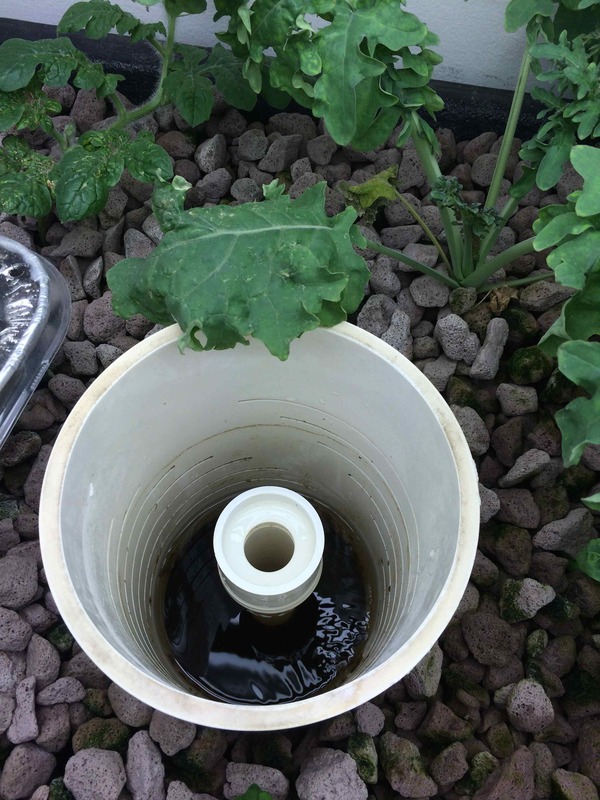 These nitrates are then cycled through to the root system of the plants providing food for their growth, when combined with water and light (sunlight ideally). Okay, so that makes sense, grow plants with a natural fertilizer. But why not just grow the plants in soil and add fossil fuel based fertilizer like the good old days? One reason was already mentioned, the high toll we pay due to transportation costs. Another benefit of aquaponics is the use of 90% less water than conventional agricultural systems. Perhaps the most important results are some of the freshest, most delicious vegetables and fish you'll ever taste and enjoy anywhere. Getting to the point where we grow more and more food locally will also benefit our communities resilience to the high cost that climate change, increasing fossil fuel costs (ie. peak oil), and pollutants are playing with our globalized agricultural system. There is nothing like seeing your food growing locally and know that it was picked or caught just minutes or hours before you eat it. Not only that, you can see what has gone into it and ask the aquaponics farmer exactly what went into it. 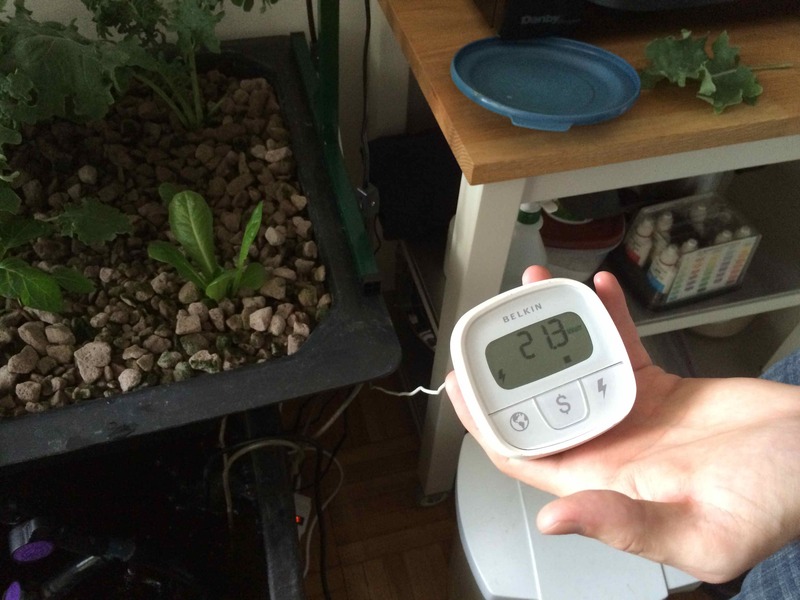 Getting started in aquaponics is easy according to Alec. 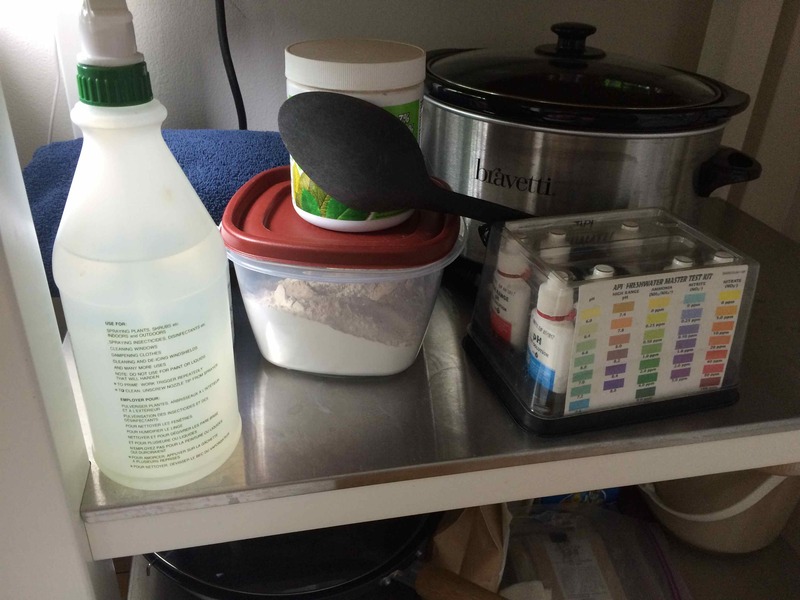 The main components are relatively inexpensive and easy to find and purchase. 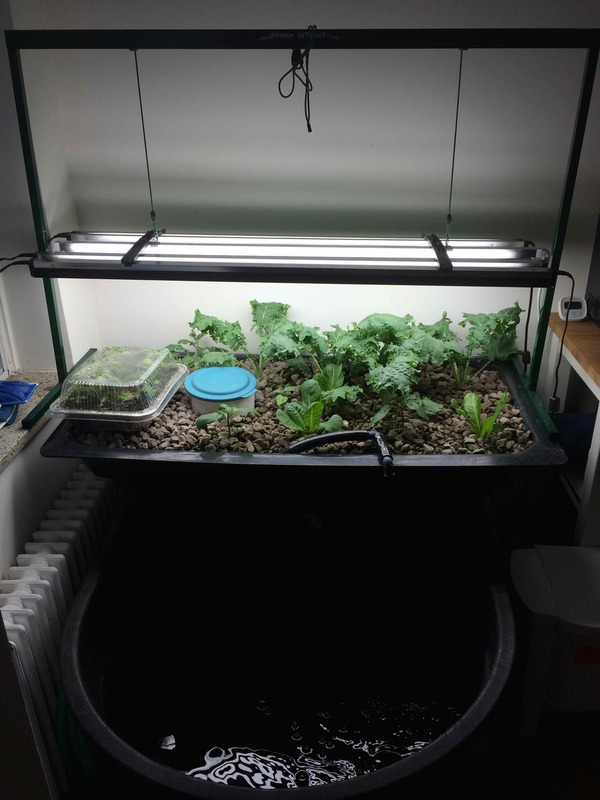 The main components are a 110 gallon tank (http://growitall.ca) for $60, a grow bed for $40, some environmentally friendly recycled glass grows stones ($140), some T5 lights (5 for about $100), an aquarium water pump for $50, and a bell syphon to create the ebb and flow. Add some gold fish or other fish (to learn with before getting into Tilapia for about $5-6/fish). Pick some of your favourite kale, romaine lettuce, peppers, herbs and more to plant, and away you go. To maintain and monitor the water quality for PH you'll need a kit for testing the water. Some fish food...Alec uses Martens Trout feed for his tilapia (he's moved on from the original set of gold fish he had when he started). Alec got his tilapia from Noa's (check out http://www.noafisheries.ca/. 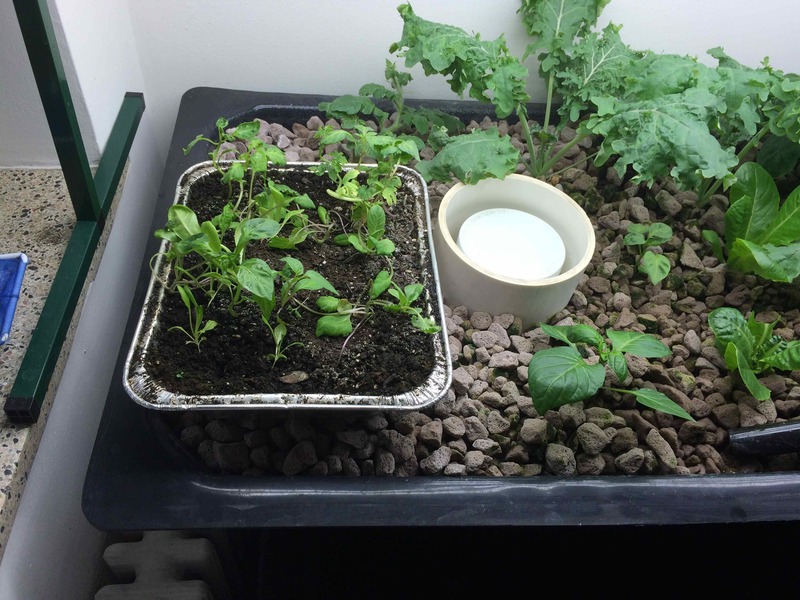 During out visit Alec had 4 kale, 4 romaine, and 2 types of bell peppers growing nicely. I tasted the kale and romaine. Both were wonderfully fresh and delicious. I was amazed at how little bitterness the kale had. Currently Alec has 35 tilapia that are already quite large. He says that with five feedings a day the small tilapia he received can be harvested in six months. With 35 fish there should be three times as much grow bed as the current single one he has operating currently in his kitchen. Alec says it is a good idea to keep plants at a variety of stages of growth so that you can continuously harvest. In addition to the aquaponics system, Alec has a small flat of seeds started so that he can transplant in some new plants soon. Thinking about the future and larger more commercial scale development of his aquaponics system, Alec imagines a deep water raft system which has no grow medium, just plants in a raft floating on the water. Apparently the maintenance of the grow medium would be much easier with this type of grow bed system. That's all for now. Stay tuned for more updates and new projects.